Last week, Skype for Web ended support for Firefox, Opera and Safari (in other words, all browsers that are not Edge or Chromium-based). In contrast to what many websites communicated though, Skype did not end support for Linux. It works perfectly fine in, for example, in Chrome and Brave. So if you can still use Skype for Web on a browser in Linux, what’s the problem? Well, it isn’t. At least, not for us. It might become a problem for Skype because there are so many good alternatives that do offer support for Firefox, Safari and Opera. And these alternatives work just as well (if not better). So what are these alternatives? And what are their pros and cons? One option is to choose another proprietary business solution like GoToMeeting, Cisco WebEx and Zoom. In terms of usability, these tools are doing great. They also support most browsers but, as they are proprietary, control of your data exchange is in the hands of the provider. Plus, some of them are quite the financial investment. If that’s not an issue, they might be worth looking into. Skype started as a video calling platform for consumers so you could go for a proprietary consumer platform like Google Hangouts and WhatsApp. Google Hangouts supports most browsers and WhatsApp is browser-independent. Of all these alternatives, consumer platforms are the least transparent, so if data privacy is a concern for you, a consumer solution is probably not the best idea. Our recommendation is to use an open source solution that is based on the leading open standard for speech and video communication: WebRTC ‑ like Kopano’s progressive web app for video calling ‘Meet’. Why? Because open source solutions allow for transparent communication so you won’t have to dance to your vendor’s tunes. In addition, the by now well-established WebRTC standard eliminates the need for plugins or special software to make audio or video calls. With more than two billion users already having access to a browser supporting WebRTC, this is a great plus. As far as browser support goes, the WebRTC standard offers the widest range of support, including but not limited to Chrome, Safari, Opera, Firefox, Baidu and Edge. What about privacy and usability? So are these open source alternatives are as good as Skype? Although Skype was (one of) the first video calling app that was mass adopted, we should not overestimate Skype’s ability to govern the world in the next decade. As data privacy rises on the list of software requirements, alternatives that allow for complete control over corporate data gain ground. Recently, the German government published a report on Digital Sovereignty with a list of criteria considered important by the modern CIO. One of the forum users of ghacks summarized the criteria so let’s look at this list and see how Skype and Kopano Meet stack up in the comparison. Looking at the answers provided it is safe to say that open source WebRTC solutions are the better option when it comes to data privacy from the perspective of an individual user, company and regulation. 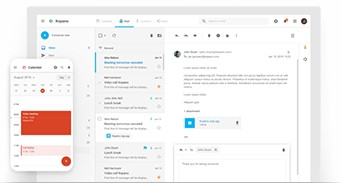 As for usability, Kopano Meet is still in development but it already includes the most important features Skype has to offer like a well-designed interface, one-to-one and one-to-many calling and easy availability on mobile. Soon, many-to-many video calling and screen sharing will be added to the list of features. Can I get Kopano Meet for my organization? Want to keep updated on the latest Meet developments?